Heritage Tour of India – The soul of India lies in its many ancient monuments and temples you’ll find almost everywhere. Here, we’ve encapsulated India in an itinerary that showcases world heritage monuments in Delhi, Agra and Fatehpur Sikri, the forts and palaces of Jaipur, Jhansi and Gwalior which survive to narrate tales of valour and courage; and Khajuraho which reveals the highly evolved thinking of its medieval rulers. 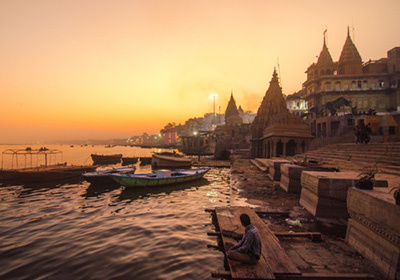 To complete the Indian experience, take a walk down Varanasi’s bathing ghats and be a part in the ritual that pays homage to the holy and benevolent river Ganga. Arrive in Delhi and check into hotel. Depending on the time available, rest, shop, or take a sightseeing tour of the city. Delhi is the country’s capital, and has a host of man-made attractions that have made it to the World Heritage list. The city offers great opportunities for shopping from any of its local markets, state emporia, and of course, the malls. If you’re a heritage buff, do visit the Red Fort, Humayun’s Tomb and the Qutab Minar. The magnificent Akshardham, Lotus and Birla temples are not to be missed either. Depart early for Jaipur to cover the distance of 258 km in 6 hours. Check in at the hotel and after lunch, proceed for a half day tour of the city’s attractions. The Amber and Jaigarh forts, Jantar Mantar and the Hawa Mahal are architectural masterpieces of the past. Jaipur is Rajasthan’s capital city with a rich tradition of art and culture. After breakfast, you may take a trip to Samode Palace, 42 km from Jaipur. Return to Jaipur for lunch, and shop around for exquisite handicrafts, textiles and trinkets at any of the local shopping markets in Jauhari Bazar, Nehru Bazar, Nehru Bazar, Tripolia etc. In the evening, visit Chokhi Dhani, an ethnic Rajasthani village resort. Enjoy the village dances and the folk music with the delectable local cuisine. Depart early for Agra, 220 km. Enroute, halt at Fatehpur Sikri, 180 km from Jaipur. Fatehpur Sikri was Akbar’s dream city, built to honour the saint, Sheikh Salim Chisti who blessed him with a son. With some impressive monuments like the Buland Darwaza, Anup Talao, Jodhabai’s palace, Raja Birbal’s house, the Diwan-i-Am and the Diwan- i- Khas to boast of, it has earned the status of a World Heritage site. Continue journey to Agra and check into hotel. Proceed to visit the icon of India’s heritage, the Taj Mahal. The Mughal Emperor Shah Jahan built this glorious monument for his beloved wife Mumtaz Mahal in 1653. Take your time to view this wondrous work of art which has earned it a place in the list of the world’s Seven Wonders. Board the Shatabdi Express to Gwalior from Agra railway station at 8:17 hrs. The 222 km distance is covered in one and a half hours. Alight from train in Gwalior at 9:45 hrs and check into hotel. Proceed for day trip of the city. Gwalior is the historical city of the Scindia royal family, and its hill top fort dominates its skyline, standing majestically in the background. Take a tour of the fort, and visit the tombs of Ghaus Mohammed, a 16th century saint and Mian Tansen the singer in Akbar’s court, and the opulent Jai Vilas Palace, built on the lines of the Palais de Versailles in France. Depart early for Jhansi by road, 97 km. Jhansi is the home of the legendary Rani Laxmibai who led the revolt against the British in 1857. The Jhansi Fort built by Bir Singh Deo, has many stories to tell of the Rani’s struggle to safeguard her kingdom from the British. After lunch, proceed to Orchha, 98 km. Orchha is the heart of Bundelkhand and known for its 16th century temples, the Rama Raja temple, Chaturbhuj temple and Lakshmi Narayan temple. Arrive in Orchha and check into hotel for overnight stay. Day 7 Orchha – Khajuraho 90 km. After breakfast, take a tour of the town’s attractions, including the Jahangir Mahal, built by Bir Singh Deo especially for his friend Emperor Jahangir who visited him in 1606; and the Raj Praveen Mahal, Palki Mahal and Phool Bagh which are enveloped in tales of intrigue and conspiracy the guide would be only too happy to reveal. Post lunch, depart for Khajuraho 176 km. Arrive in Khajuraho and check into hotel for overnight stay. The stunning architecture of the Khajuraho temples leaves every visitor spellbound. The Chandelas who ruled for five centuries patronized the building of 85 temples in a secluded village with unabashedly carved sculptures depicting every aspect of human life. These temples built during 950 AD and 1050 AD, of which only 25 remain, are spread in three directions, and accordingly referred to as the western, eastern and southern groups. After breakfast, spend your time at the Khajuraho temple site set amidst landscaped lawns. Check out of hotel to catch morning flight to Varanasi from Khajuraho airport, 45 min flying time. Arrive in Varanasi and check into hotel. Varanasi is the holiest of Indian cities, a place where you can wash away all your sins with a dip in the sacred river Ganga . It is also a very ancient city, with historians setting the date back to 1400 BC. Its temples have suffered the wrath of the Mughals, especially Aurangzeb who had scant respect for other religions. The bathing ghats in Varanasi breathe spirituality – 80 of these line the riverbank where devotees bathe. There are dedicated burning ghats as well, such as the Manikarnika. Your morning in Varanasi can begin with a boat ride between Dasaswamedh Ghat and Harishchandra Ghat which would take almost an hour. After lunch, make the trip to Sarnath, the site of Buddha’s first sermon after achieving enlightenment. Emperor Ashoka built a stupa and monasteries at the spot in the 3rd century BC. A decline of Buddhism and plunder by Muslim invaders in medieval times brought the city to rubble. Excavation by British archaeologists retrieved some of Sarnath’s past glory, and today it is a peaceful suburb of Varanasi. Return to Varanasi before dark to catch the glorious spectacle of the “Ganga Aarti” in the evening. You can choose the Dasaswamedh Ghat to participate or observe the daily ritual of paying homage to the holy and benevolent river Ganga. The ritual starts after sunset, wherein large lamps are lit up and smaller ones swung to the beat of the ‘mantras’. Devotees light lotus flower candles and set them adrift in the water.